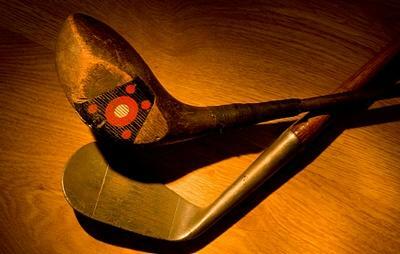 The value of antique golf clubs depends on supply and demand, just like all antique items. There is a significant difference in the value of antique clubs today than there was just ten years ago. When it comes to collectible antique golf clubs, it is estimated that fewer than 5% of all antique clubs with wooden shafts have collectible value beyond decorative or playable worth. The majority of the vintage or antique clubs that you will find at yard sales or on eBay are common golf clubs with very little value. Common vintage golf clubs in today's market are worth $10-$20. The same club 10-15 years ago would have been worth $40-$50. The demand was much higher back then, especially with foreign buyers. The internet has helped bring a flood of antique golf clubs to the market, where the demand has steadily decreased over the last decade. Serious collectors and antique dealers have no interest in common vintage golf clubs. They are only interested in the rare and hard-to-find golf clubs. Rare vintage golf clubs have uncommon patents or features and were made in limited quantities that set them apart from the mass produced common clubs. You can also sell your vintage golf clubs through an antique broker online. Larry and Carole Meeker are antique dealers and own AntiqBuyer.com and Patented-Antiques.com. The Meekers will list and sell your antique golf clubs for you. If you should happen to inherit a set of antique golf clubs from your recently deceased grandfather, chances are they are probably worth more to you as items with sentimental value than they would be worth on eBay. However, there is still a small chance you may be lucky enough to have inherited a set of rare vintage golf clubs that avid collectors dream of getting their hands on. It may certainly be worth your time to find out.